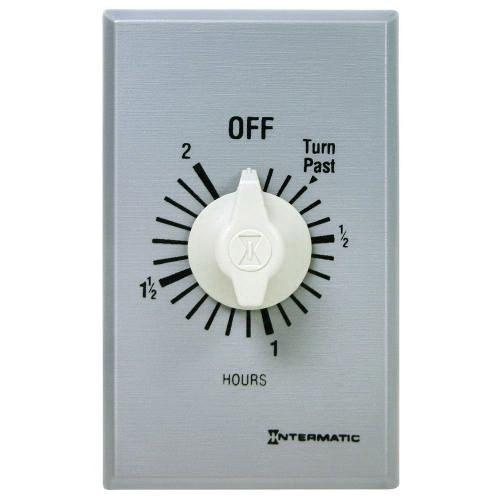 Intermatic FF Series 1-Pole Commercial spring wound countdown timer in white color, is rated at 125-277-Volt AC. It features auto-OFF action and SPST contact configuration to provide maximum conductivity. It has contact rating of 10-Amps at 250/277-Volt AC, 20-Amps at 125-Volt AC resistive and 7-Amps at 125-Volt AC incandescent load rating (multi-gang). Timer has maximum breaking capacity of 1 hp at 125-Volt AC and 2 hp at 250-Volt AC motor. This timer features front terminal to offer better wiring connection. It has timing range of 2 hours. Timer is suitable for bathroom fans, spas, hot tubs, storage closets, garage lights. It features plastic enclosure. It automatically limits On time for energy consuming loads. It measures 44.5 mm x 31.8 mm x 104.8 mm. Wall mountable timer withstands temperature rating of 0 to 40 deg C. Timer is UL listed and CSA certified.